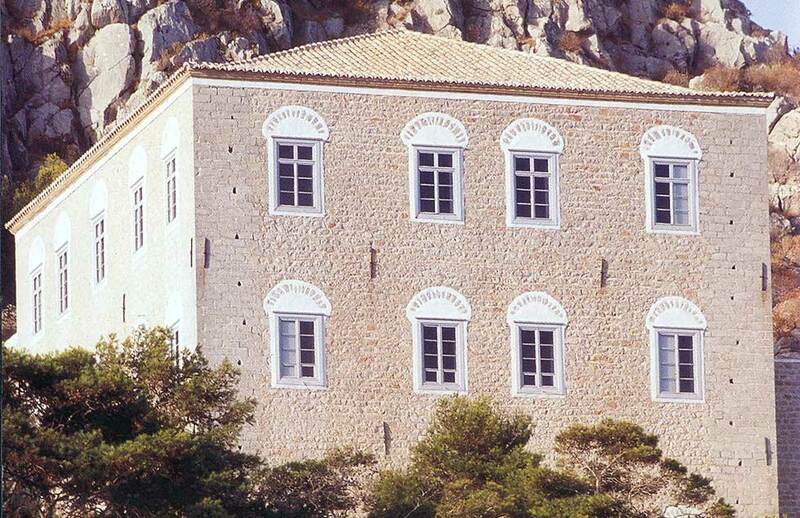 The Manor of George Kountouriotis is located to the west side of the harbour, to the bank of the hill, between the pine trees. It was built in the 18th century. George Kountouriotis, brother of Lazaros, was one of the greatest ship owners of Hydra and got involved with politics during the Greek Revolution and to the years that followed. He came from a rich and historical family, with great maritime tradition and had a tremendous education. He participated in the Second National Assembly at Astros and in December 1823 he was elected president of the executive council in Messolongi, on the initiative of Alexander Mavrokordatou after disagreements of fighters in the First National Assembly of Epidaurus. He had two sons, Andrew and Mary, widow of Mexi and later the wife of Benizelou Rufus, while his grandson was Paul and his great-grandson Theodore Koundoriotis. In 1824 he elected president of the executive council of Greece and formed his own democratic goverment in Nauplio. He had to resign in 1826. In 1836, he was the first president of the Board of "Filekpedeftiki Company", now known by Arsakia Schools. After the murder of the governor Kapodistrias, to whom Kountouriotis acted argumentative, he elected as President of the Senator and the cabinet council. The grandson of George Kountouriotis, Paul, inherited the Manor. Paul was a political figure, who also elected Minister of the Navy, captain of the Greek fleet, President of the Hellenic Republic and viceroy. In 1991 the three stories tall Manor was bought from the Ministry of Culture and then it operated as a Museum. Inside there are exhibits of family heirlooms and exhibits from the newest history of Hydra.